It was January, and I had received a flurry of emails about Jewish activities. I had recently moved to Boston, and was trying to find the balance of Jewish engagement that would feed my spiritual and social needs. I was immediately drawn to a program of informal Jewish learning. I reached out to my friend Neil Hirsch, a Rabbi and one of the Eser teachers to ask to whom I could speak with to find out about accessibility. 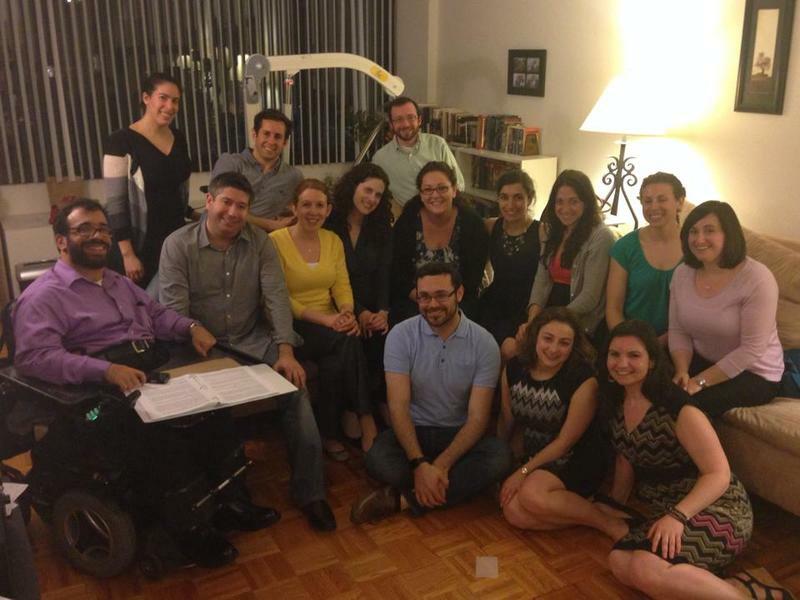 I am in a wheelchair, and home hosted events can pose a challenge. I was put in touch with Elisha Gechter, who told me that none of the planned locations were accessible but that Boston, my own neighborhood, was still looking for a home. With a little bit of trepidation, I offered the apartment that I had moved into less than three months before. The day before I was contacted by my Eser group leader, Ben Ginsburg. He said he would come early to set up the 17 chairs that we would need for our group. I frantically goaded my assistants to clean the house from top to bottom. I bought enough paper goods for a high school graduation. As I sat there that Thursday, waiting for Ben, I think my tension was its own living thing. Ben arrived, and in his jovial fashion, began to set up. My group began to arrive and one of them, Karen, was a childhood friend. Then Rabbi Yonah Berman got down to teaching, engaging us in a modern, humor filled take, on the most ancient and sacred of Jewish activities, learning. As the weeks progressed, Ben would sometimes be delayed in his arrival. The first time his train was delayed, I got very worried. People would arrive. My house would not be ready. I would be embarrassed. But, the first group member arrived, greeted me as an old friend, and began to set up my home. Every week different people helped. They set up my home. Walked with me to the train from Shabbat dinners. In the classes, we began to learn and value each other’s perspectives, always guided by Yonah’s vast knowledge and good humor. By the time the last week came, I was welcoming a group of friends into my home so that we could learn together. What set up help I needed was nothing more than that group preparing what, for that couple of hours, had become our sacred space. This, then, is when I got from Eser. Learning, certainly. Friends, joyfully. But, even more than that, an apartment which still felt somewhat alien when I began hosting in February had become a home, a sacred space wherein I had memories of learning with my friends. I know that this was not an intended benefit of the Eser program, but, I am grateful for it nonetheless. Matan Koch is a lawyer and freelance disability consultant who recently moved to Boston. The son of a Rabbi and a Jewish educator, he has a lifelong interest in formal and informal Jewish learning, including an undergraduate degree in religion, and many years in NFTY, Jewish summer camps, and congregational learning in Reform, Conservative and Orthodox environments. He finds that Eser is a wonderful match for these diverse interests, providing high-quality content from teachers who make it accessible to those of all backgrounds in an informal and friendly environment.